Barring a catastrophic malfunction or damaging impacts from space debris, NASA should be able to keep the International Space Station (ISS) in operation at least through 2020 and, with steady funding, careful planning and a bit of luck, through 2028 -- the 30th anniversary of the first module's launch -- officials say. But reduced power from degraded solar arrays and other crippling consequences of decades spent in the extreme environment of space will slowly but surely take their toll and the cost-benefit ratio eventually will tilt in favor of abandonment and a fiery controlled re-entry. While the engineering and management challenges associated with keeping the station operational are daunting, ISS program manager Michael Suffredini says they should be doable, as long as NASA has the resources to build spare parts, pay for cargo launches and provide transportation for U.S. astronauts, either aboard U.S. commercial spacecraft or Russian Soyuz capsules. "We have a space station that is designed in a modular fashion meant for repair," Suffredini told CBS News. "So as long as you have spares for all the things that can break, you can last as long as the structure will let you last. Within reason. "The structure, it turns out, most of it was originally designed for 30 years. So all that margin has made it relatively easy for us to get to 2020. 2028 will be a little bit more challenging. ... We may have to sharpen our pencils to get to 2028." Boeing, NASA's space station prime contractor, is currently conducting a detailed engineering analysis to verify that the U.S. segment of the complex can safely operate through the end of the decade. Russian engineers are assessing their own hardware, as are the other international partners. The Boeing analysis is not yet complete and additional work will be needed to to show the lab can be safely operated beyond 2020. But Suffredini said no major surprises have cropped up so far and he's optimistic the station eventually can be cleared to fly through 2028 -- in theory, at least. "When we get to 2028, the solar arrays are going to be struggling, I'm probably going to have a handful of radiator lines that have been isolated," he said. "2028 might be possible, but it also might be very challenging because then you're talking about the cost of replacing big things that may be prohibitive. "All our analysis kind of says we think we can get to 2028 and that's the path we're headed on. As we start getting beyond 2028, if it makes sense, and things aren't failing at a rate that makes it difficult for us to keep up, and the country thinks it's the right thing to do, then we can look at going beyond that. "But 2028's kind of where we're drawing our line today based on the original design of the structure." The first element of what would become the ISS was the NASA-financed, Russian-built Zarya propulsion and storage module, also known as the Functional Cargo Block, or FGB. It was launched 15 years ago this November by a Proton rocket. Two weeks later, a space shuttle carried the first NASA component into orbit, the Unity connecting node, and the two were "mated" to form the core of the station. NASA modified the assembly sequence in the wake of the 2003 Columbia disaster and a subsequent decision by the Bush administration to retire the shuttle by the end of the decade. The U.S. segment of the outpost was declared complete after the final shuttle flight in July 2011. To understand the engineering challenge facing space station operators, it helps to visualize the 900,000-pound structure as it orbits the Earth, 260 miles up, streaking through space at 5 miles per second and enduring temperature swings of 500 degrees Fahrenheit as it moves from sunlight to shadow and back again. The long axis of the lab complex, normally oriented in the direction of travel, generally stretches out like a train, with pressurized modules connected fore and aft like passenger cars. At the front end of the complex -- the locomotive in the train analogy -- the U.S. Harmony module leads the way, with the European Space Agency's Columbus laboratory attached to a right-side port and Japan's Kibo lab extending to the left. Harmony's aft port is connected to the U.S. Destiny laboratory module, which in turn is bolted to the central Unity connecting node. The U.S. Quest airlock extends to the right and the Tranquility module extends to the left. A cargo storage compartment extends straight down and a set of four massive gyroscopes, used to re-orient the station and maintain its commanded position, or "attitude," is housed in a short truss that extends from Unity's top port. The U.S. segment of the station, which includes ESA, Japan and the Canadian Space Agency, extends from Unity forward. The Russian segment begins just beyond Unity's aft port where the Zarya module is attached. The Russian Rassvet module extends down from Zarya and serves as a docking port for unmanned cargo ships and manned Soyuz spacecraft. Bringing up the rear of the space station "train" is the Russian Zvezda command module. The Poisk docking compartment extends upward from Zarya and the Pirs module, which serves as a docking port and an airlock, extends straight down. An aft port is available for manned and unmanned vehicles. 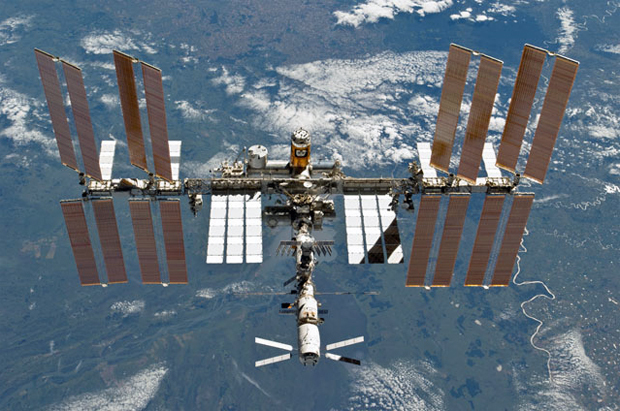 The Russians plan to replace Pirs next year with a large laboratory module. Later, they plan to attach a multi-port docking compartment to the new lab and then a solar array assembly that will extend from that module to the right. Mounted at right angles to the long axis of the station is its primary solar power truss, a huge assembly spanning the length of a football field that houses critical electrical components, ammonia coolant loops and steerable radiator panels. The Canadian robot arm can move from one side of the truss to the other atop a mobile platform. On each end of the truss, four huge sets of solar arrays rotate like giant paddle wheels to track the sun as the station orbits the Earth. The entire lab complex can be maneuvered, or re-oriented, by firing Russian rocket thrusters or by changing the speed of NASA's gyroscopes inside the Z1 truss atop the Unity module. Rocket thrusters are typically used for major maneuvers while the gyros are primarily used for more minor attitude changes. The power truss is anchored to the long axis of the station by 10 massive struts that connect the central S0 truss segment to the top of the Destiny laboratory. Those struts, like all of the station structure, expand and contract as the lab moves into and out of sunlight. They also have to handle the stresses generated when the station is maneuvered, when visiting vehicles dock at the outpost and when Russian thrusters are fired to boost its altitude. Those same forces also act on module ports and attachment fittings. While the station might appear to be a rigid structure, it actually bends and flexes under a wide variety of loads. And that flexing, repeated year in and year out, poses a threat to the lab's structural integrity. To assess the long-term structural health of the station, Boeing engineers developed detailed computer models based on NASA's projected use -- the expected stresses caused by future dockings, reboosts, crew activity and thermal cycles -- and combined that with actual data from on-board accelerometers and strain gauges. The idea was to characterize the stresses acting across the station to identify areas of particular concern and to find out how they will fare over an extended mission. "What we're looking at is theoretical crack growth," Pamela McVeigh, the engineer in charge of the Boeing structural analysis in Houston, told CBS News. "So the failure mode would be you'd have a crack beginning, probably (at) a bolt hole, and the crack would grow to another edge. So you'd lose like a flange on a C-beam, or an I-beam. The stiffness of your structure would then change, the bolt hole you that you were growing the crack out of, now that bolt wouldn't be effective." McVeigh's boss, Boeing space station vehicle director Brad Cothran, said the stress comes from a combination of mechanical loads and temperature. "It doesn't really care which one broke it," he said. "If the loads get high enough in a piece of structure, it will cause it to either yield or hit ultimate, which means crack in half." And once a crack starts, it can propagate and eventually weaken the affected component. McVeigh said the phenomenon is similar to bending a paperclip. "If you bend that paperclip back and forth, back and forth, back and forth, eventually it snaps," she said. "That's essentially what we're trying to prevent from happening. Repetitive stress, thermal and mechanical, is one area of concern. Another is making sure periodic rocket firings or other activities don't overly "excite" the station structure, setting up some sort of harmonic oscillation. "That's what we want to avoid," Cothran said, "anything that hits a mode of the structure that would cause an interaction. Think about the Tacoma bridge. It starts rocking and it just violently comes apart, right? So those are the kinds of things we want to avoid." He was referring to the ill-fated Tacoma Narrows Bridge, a one-mile-long suspension bridge in Washington state that collapsed in 1940, four months after its dedication, when 40-mph winds coupled with the bridge's natural vibration mode to set up a catastrophic "torsional flutter." "We have seen some of those kind of interactions," Cothran said. "Nothing like the bridge, it didn't keep going, but we've seen some things interact up there." He recalled a yaw maneuver about a year ago, when the station was rotated 180 degrees so Zvezda was in front and Harmony was at the rear. "A lot of times, we flip the station around and fly backwards when people come to dock and just in that simple yaw ... 180 degrees, that was one that really sent us into a tizzy," he said. "What happened was, as the control system saw us spinning, there was flex in the structure, it appeared the structure wasn't moving. Then it would cut off and the structure would move ahead. Then it would fire on again. So we got into this oscillation setting up in the structure, that we were like whoa, time out. Don't do that again, right?" Such oscillations can be corrected by updating the station's control software to change the timing of rocket firings and other activities. Even so, the station endures constant stress and strain from normal, day-to-day operations. As it turns out, the struts connecting the power truss to the Destiny module are not the area of highest concern. "The 10 struts that connect the S0 to the lab are definitely one of the areas we wanted to look very closely at," McVeigh said. "The lab side of that interface didn't turn out to be too much of a concern. The struts themselves are very beefy. It's the connections at the two ends. The S0 side is a little more challenging, but the teams were able to show the connections are good to 2020." Interestingly, one of the areas of highest stress on the station is the integrated electronics assembly at the base of the far left P6 solar array. The P6 truss segment was launched early in the assembly sequence and because the solar panels turn to track the sun, the P6 IEA has experienced higher heating than other components. But McVeigh said the hardware should be good through the end of the decade and while the Boeing analysis is not yet complete, "I'm feeling fairly confident in reaching 2020," she said. "I have not seen anything that rules it out. I've seen a few things that will be challenges." Along with structural integrity, the Boeing study is focussed on three other areas: systems that could suffer catastrophic failures unrelated to fatigue; the availability of critical spares; and the expected lifetime of key components. Even with a sound structure, the station still faces the possibility of catastrophic failures resulting from micrometeoroid impacts or collisions with space debris. The station was designed to withstand the sorts of impacts expected over its lifetime and flight controllers are always on guard for possible "conjunctions" that might require the station to maneuver out of the way. Boeing engineers are focusing on systems like the station's high-pressure oxygen tanks and 3,000-psi lines attached to the Quest airlock that are used to repressurize the compartment and service spacesuits. "We wanted to make sure those kind of things weren't going to fail that could result in a catastrophic hazard," Cothran said. "We've been through all that analysis now and we've cleared all those systems. Our oxygen high-pressure system ... turned out to be very robust." Other equally important systems include the station's ammonia coolant loops and radiators, which are used to get rid of the heat generated by the lab's electronics. But in that case, a failure would impact the operation of the station, not threaten its survival. "If I ever get a hole in an ammonia line, it will be a challenge for us to find it and repair it," Suffredini said. "The only way to ID (a leak) is to actually see the ammonia coming out and the conditions usually don't stay right to see ammonia coming out very long once you start to lose pressure." As a result, NASA has ordered a high-tech sensor that the station's robot arm can move about to sniff out low-level traces of ammonia. The sensor should be ready for launch in about a year and a half. The availability of critical spares is another area of focus for the Boeing engineers, making sure the components currently in orbit have backups available or in the pipeline for launch before a failure might occur. New lithium-ion batteries, which feed stored solar array power to the station when the lab is in Earth's shadow, are scheduled for launch in 2017 that will keep that system healthy through 2020. More than a ton of spare parts are being readied for launch to upgrade the Zarya module, and a steady stream of components is in production for launches downstream, including high-pressure oxygen and nitrogen tanks and ammonia coolant pumps. The solar arrays themselves are degrading over time as a natural consequence of flying in space, but Cothran they will continue to supply the station's electrical needs through 2020. Getting to 2028 will require increased efficiency and at some point, the Russians, who currently get about 8 kilowatts of power from NASA's arrays, will have to rely on their own solar panels. "We can be more efficient in our distribution system ... so the power to the end user, even though you've lost it at the transmission station, your end user will get some more power," Cothran said. "We're even thinking out of the box. Ten years from now, if you just wanted to go throw some dumb blankets out there, if you will, and just wrap them around the truss (you would) get something out of them. There are all sorts of things the team is looking at that we could do." Shelf life is another challenge facing station operators. Electrical components might be used, or stored, for many years and Boeing is doing a top-to-bottom analysis to identify internal systems that might be susceptible to failure after extended periods in storage, either in space or on the ground. One problem already identified: programmable computer chips that somehow lose their internal charge over time. "We've got a lot of data points that say that those (chips), once they start getting into double-digit years, they lose their internal charge and can't necessarily retain their memory," Cothran said. "It's not something you find in the commercial industry because cell phones, laptops, anything we use down here on the ground has only got a useful life of three to five years, right? "But since a lot of our parts were built back in the 90s and we've got spare units, it's something we're having to worry about. It's not that it totally fails, what we have to do is we have to go back in and refresh it. So it's not something that's a show stopper, it's just something we learned and as long as we're proactive, we're fine." Assuming the primary structure passes muster and no show stoppers turn up in the areas of shelf life or catastrophic failure scenarios, ensuring a steady supply of spare parts will remain NASA's major technical challenge through 2020 and beyond. "It's a whole integrated process to make sure every one of the (replaceable components) will last to 2020, and you've got the right sparing," Suffredini said. "And then every year, we redo our analysis to see is this better or worse? You can imagine that for everything that's failed, that's a new data point. "If I do my job right, we really could go to 2028 if I don't have ... to buy a whole bunch of new hardware, I just keep going and just let the analysis year to year tell me what I have to do."